This is a base class for the CEvaluationLexer adding member attributes to enhance the internal functionality. Definition at line 39 of file CEvaluationLexer.h. Definition at line 45 of file CEvaluationLexer.h. Definition at line 56 of file CEvaluationLexer.h. Definition at line 108 of file CEvaluationLexer.h. Convenient function to free the list of generated nodes. Definition at line 73 of file CEvaluationLexer.h. 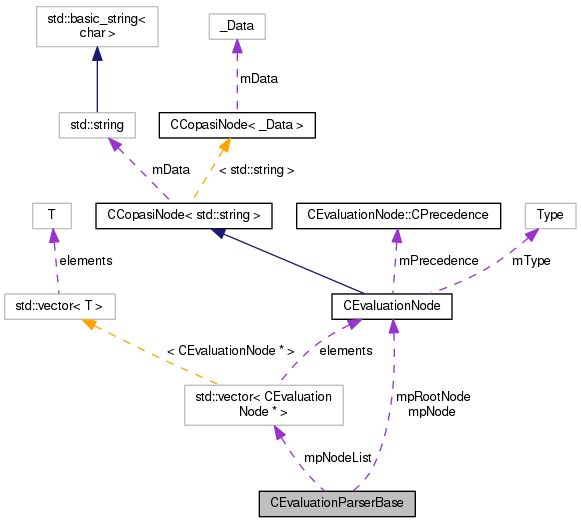 Referenced by CEvaluationTree::parse(), CEvaluationTree::setRoot(), CEvaluationTree::updateTree(), and CEvaluationTree::~CEvaluationTree(). Definition at line 98 of file CEvaluationLexer.h. Retrieve the generated list of nodes. The user owns the list and is repsonsible for the destruction. To delete the list please use freeNodeList. Please note that each call to yylex() creates a new list which must be destoyed. Definition at line 66 of file CEvaluationLexer.h. Definition at line 94 of file CEvaluationLexer.h. Definition at line 96 of file CEvaluationLexer.h. Definition at line 1324 of file CEvaluationParser_yacc.cpp. References setBooleanRequired(), YY_, YY_IGNORE_MAYBE_UNINITIALIZED_BEGIN, YY_IGNORE_MAYBE_UNINITIALIZED_END, YY_REDUCE_PRINT, YY_STACK_PRINT, YY_SYMBOL_PRINT, YYABORT, YYACCEPT, yydestruct(), YYDPRINTF, YYEMPTY, YYEOF, yyerror, YYFINAL, YYID, YYINITDEPTH, YYLAST, YYLEX, yylval, YYMAXDEPTH, yynerrs, YYNTOKENS, yypact_value_is_default, YYPOPSTACK, YYSIZE_T, yyalloc::yyss_alloc, YYSTACK_ALLOC, YYSTACK_BYTES, YYSTACK_FREE, YYSTACK_RELOCATE, YYSTYPE, yytable_value_is_error, YYTERROR, YYTRANSLATE, and yyalloc::yyvs_alloc. Definition at line 103 of file CEvaluationLexer.h. Definition at line 101 of file CEvaluationLexer.h. Definition at line 104 of file CEvaluationLexer.h. Definition at line 105 of file CEvaluationLexer.h. Definition at line 102 of file CEvaluationLexer.h.